An e-fit of a man who raped a 40-year-old woman after trying to steal her bike has been released by Essex Police. The woman was cycling to shops near Church Hill, Basildon, on Thursday afternoon when the incident happened. After a struggle, the woman ran off across open land but collapsed due to a medical condition. She came round to find she had cuts and bruises on her body and police were called. The attacker was wearing black clothing. 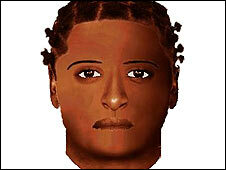 He was black, 5ft 8in (1.73m) to 5ft 9in (1.75m) tall and of medium to large build. He has short "hair balls" all over his hair with defined partings. The woman was attacked after the man had tried to steal her bicycle while she was riding to local shops. Police house-to house enquiries continued in the area on Saturday and officers based at a mobile police station at the scene were appealing for any information from local residents. Det Insp Roy Fraser said: "We believe this image is a very good likeness of the man involved in the attack, although the hairballs might be much larger than the e-fit shows. "He has some very distinctive features and if anyone knows who he is they should contact us immediately." Anyone with information is asked to call Essex Police.